Limited space in your shop? Add a Skat Blast Wheel Kit and make your cabinet portable! Also saves time and effort when cleaning around the cabinet. 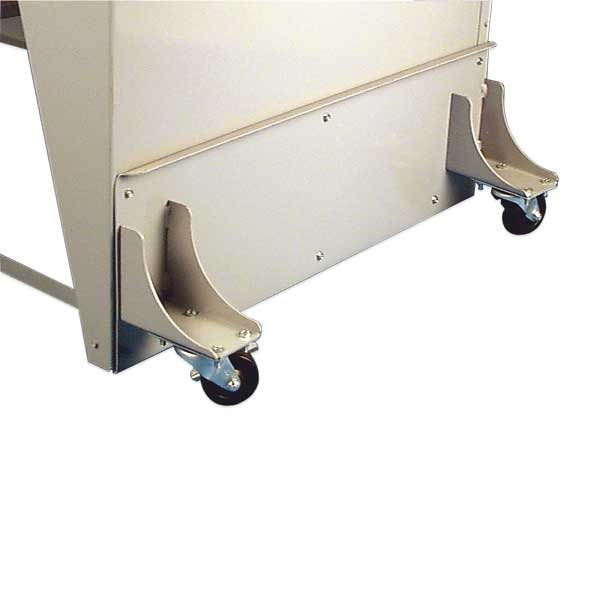 BOLT-ON Wheel Kits have 2-1/2" diameter swivel casters (3" diameter on 6120-34) for easy maneuverability. Also, locking feature to hold cabinet in place. 14 gauge welded steel construction for durability. Made in USA. Kits include: left and right wheel assembly and mounting hardware. Standard Wheel Kits raise cabinet 1". Extra-High Wheel Kit raises cabinet 3". Extra High Wheel Kit with 2-1/2" diameter wheels. Raises cabinet 3". Fits 28" deep cabinets. Standard Wheel Kit with 3" diameter wheels. Raises cabinet 1". Fits 34" deep cabinets (except Model 1800 & 1836).